The Egyptian Print Censorship Authority has banned the import of A History of the Modern Middle East by eminent academics William L Cleveland and Martin Bunton, now in its 12th edition. Khaled Fahmy, chair of history at the American University in Cairo (AUC), said that he received an email from the university informing him that the book he had requested for his modern Arab history course had been banned from entering the country. The short email did not give any reasons for the ban. The author of All the Pasha's Men said that he has no idea of why the book was banned especially it does not contain anything that is particularly contentious. 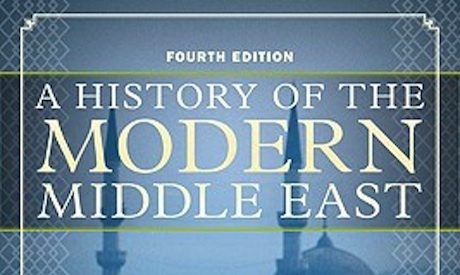 Fahmy thinks "it's an excellent simple book for the freshmen students of the modern history of the Mideast. I've been using this book for almost 10 years, for its simple smooth presentation of the modern Arab history." Fahmy expressed dismay at the ban. "It's strange how we as a society give the responsibility of the Egyptian National Security to some clerks in the Print Censorship Authority, who prove everyday that they lack the basic knowledge of the priorities of scientific research, as well as their disregard of national security too." Books that relate in particular to Egyptian military affairs since the 1950s are more likely to be banned than others. Fahmy asserted that the best way to protect national security is by making books available, not banning them. The Egyptian Print Censorship Authority could not be reached for comment. Actually, the authors of this excellent textbook are Canadians, not Americans. It is an American publication, though. In a real democracy, there is no such thing as censorship. If Egypt wants to move towards a modern democracy, it needs to get rid of the Censorship Authority. What type of democracy bans books? I guess some folks just can't handle the truth, or an opinion. Such steps result in black market of such books and other materials. When something is banned its increase curiosity in people to know it. The people interested in history will find it by other means. Noone can keep a folk happy without giving them the liberty they need and folks always try to topple the tyrants to get their own liberty if it is not given. Allah may give peace upon Egypt!